These are not your typical lightweight shorts... The XS size hits the scales at an impressively light 140g. The waistband has a one-way horizontal and vertical hook-and-loop strap as well as an external drawstring for an easily adjustable fit. They're constructed entirely of a high quality microfiber polyester. Reinforced split outer leg seams provide a greater range of motion during kicks and grappling. Email your friend about the Venum Light Gold MMA Shorts. 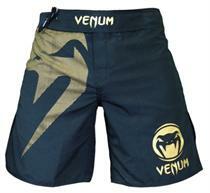 Ask a question about the Venum Light Gold MMA Shorts.